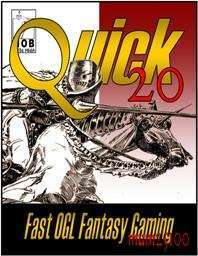 Here's Quick20 -- a full OGL-based RPG in 9 pages! Spend a minute or two on your characters, then plunge into adventure! Three character classes and a densely packed set of rules encompass freeform skills, improvised and memorized magic as well as furious combat. There are times when you want to explore complex, intricate rules -- but that's not every game, and not Quick20! It's ideal for pickup games, conventions or groups with a mix of new and experienced gamers. This title was added to our catalog on November 04, 2006.